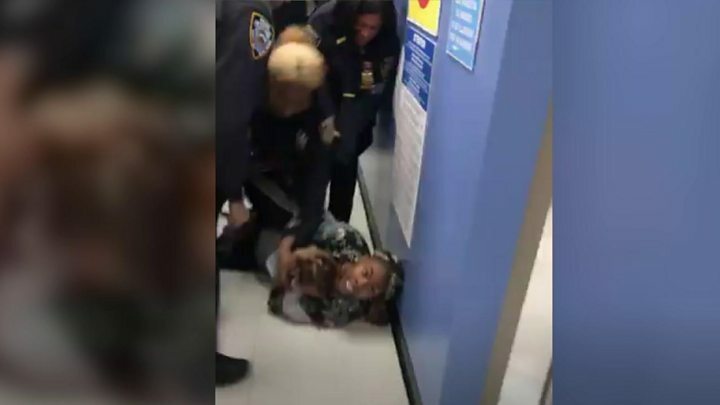 Police in New York City have dropped charges against a woman after video of her being arrested while clinging to her baby brought widespread criticism. Jazmine Headley, 23, faced charges of resisting arrest and acting in a manner injurious to a child following the incident in Brooklyn. A widely shared video showed officers trying to wrestle her baby from her as she shouted: "They're hurting my son." City officials condemned the scenes and demanded answers from police. Brooklyn District Attorney Eric Gonzalez said in a statement on Tuesday that continuing to pursue the case would "not serve any purpose and I therefore moved today to dismiss it immediately in the interest of justice". He said he had been "horrified by violence depicted in the video" and the "awful scenario of a baby being torn from his mother". City Mayor Bill de Blasio praised the decision on Twitter. According to US media, Ms Headley remains in custody on other charges. The incident took place on Friday at a Human Resources Administration office where residents can apply for public services such as food stamps. Lisa Schreibersdorf, executive director of Brooklyn Defender Services, told reporters on Monday that Ms Headley had been waiting at the office for four hours to arrange daycare for her son. As there were not enough chairs she sat on the floor with her baby, Ms Schreibersdorf said. A security guard asked her to move but there was nowhere to go. An argument broke out and the guard called police. A police statement said that NYPD (New York Police Department) officers on scene also asked Ms Headley to leave "numerous times" and when she refused again, HRA officers dragged her to the floor as police tried to arrest her. She was taken into custody at Rikers Island in New York and officials said her child was in the care of a family member. New York police commissioner James O'Neill called the incident "disturbing" and said officers' body cameras would be reviewed. The NYPD also confirmed to the BBC that the department and the HRA police had opened a review into the incident. The union representing NYPD officers, the Patrolmen's Benevolent Association (PBA), said the officers had been put in an impossible situation. "The event would have unfolded much differently if those at the scene had simply complied with the officers' lawful orders," PBA President Patrick J Lynch said. "The immediate rush to condemn these officers leaves their fellow cops wondering - when confronted with a similar impossible scenario, what do you want us to do? The answer cannot be 'do nothing'." A Facebook video of the arrest has since received more than 500,000 views.